Bill Cameron is a Signal Officer in the U. S. Army and has been stationed at Fort Hauchuca, Arizona since his return from Operation Desert Storm. He has commanded Signal Corps units at every level from company to brigade, and his overseas tours include Okinawa, Vietnam, and Saudi Arabia. His Civil War interests include the role of the Signal Corps and generalship. Brig. Gen. Gouverneur Kemble Warren has long been known as the "Savior of Little Round Top." Few have disputed the title. However, a close examination of the events prior to the actual defense of Little Round Top will show that the individual initiatives of a number of officers of the Army of the Potomac and their synergistic effect contributed significantly to the successful garrisoning of the hill, rightfully earning them a share of the title. This study does not concentrate on the defense of Little Round Top, but rather on the way in which forces were brought to bear so it could be defended. "Little Round To - Afternoon of July 2"
General Warren, chief engineer of the Army of the Potomac, spent the night of July 1 at Taneytown, Maryland. He had left the Gettysburg battlefield earlier in the evening and ridden back to Taneytown via a road east of the Taneytown Road, but was compelled to leave it and ride cross country to arrive at Maj. Gen. George Meade's Taneytown headquarters.1 He had reported to Meade and decided to rest and consult with his staff before returning to the battlefield in the morning. Warren had been born in Cold Spring, New York, January 8, 1830. A slight, intense man who was always focused on the job at hand, he graduated second in the West Point Class of 1850. The days that preceded July I were eventful ones for Warren. He had married Emily Chase Forbes two weeks earlier, had a change of Army commanders, and had turned down Meade's offer to replace Maj. Gen. Daniel Butterfield as chief of staff, all within a week. Warren was comfortable working with his new commander, but felt that he could render his best service continuing as the chief engineer. In the twilight of the war, Warren would suffer the indignity of relief from command of the 5th Corps, but the early morning of July second found him riding to Gettysburg and into the annals of American history. Later, when Warren attempted to reconstruct his activities during the Battle of Gettysburg, he could not recall when he arrived on the field.2 Based on the distance from Taneytown, it was probably as late as mid-morning. Warren held all three lieutenants in high esteem but Washington Roebling was his favorite. Roebling was married to Warren's sister and the two were close friends. Roebling would go on to follow his father in building the Brooklyn Bridge and have his health suffer because of it. Years after the war, Roebling recalled that Warren went to Little Round Top after Meade directed him to "ride over and if anything serious is going on ... attend to it. "7 In a post-war letter to Capt. Porter Farley, Warren stated that Meade sent him upon Warren's request.8 Regardless, Warren and his party rode several hundred yards from the point near Maj. Gen. Daniel E. Sickles's forward position to the northern end of Little Round Top. When he found out that the 3rd Corps was not in position, Meade had directed Sykes to take his corps out of the reserve position and support the left. Sykes received his directions shortly before 3 p.m., during a meeting of the corps commanders which Sickles had not attended.28 George Sykes had been the commander of the 5th Corps for only a few days, having assumed the position after Meade gave up corps command in order to assume command of the army. Sykes was a true professional soldier and had resisted having his corps committed "piecemeal" when Meade had originally asked him to provide a brigade to support Sickles. But when asked, by a lieutenant, to send a brigade, unsupported, to Little Round Top, he agreed to do so with alacrity. Sykes could see the importance of occupying the terrain, and sent a captain from his staff to order Brig. Gen. JamesBarnes, commanding the IstDivision, to send a brigade. Barnes' division was halted near the George Weikert house, having been brought forward via the Granite Schoolhouse Lane, while Barnes rode forward with Sykes to detail the placement of the division. "Captain, what are your orders?" The captain replied, "Where is General Barnes?" Vincent said, "What are your orders? Give me your orders." The captain answered, "General Sykes told me to direct General Barnes to send one of his brigades to occupy that hill yonder," pointing to Little Round Top. Vincent said, "I will take the responsibility of taking my brigade there." Returning to the brigade, he directed Colonel [James C.] Rice, the senior colonel, to bring the brigade to the hill as rapidly as possible, then rode away toward the northwest face of the hill. I followed him.30 "
Strong Vincent, followed by Private Norton, had ridden to the base of the hill's northwest slope and found it impractical to climb. Perhaps Warren did not see him because he was busy discussing gun emplacements with Hazlett, but Norton later commented that he never saw the signallers. Vincent rode around to the eastern side and climbed to the southern crest of the hill.43 Vincent and Norton were still mounted when they first came uponlhe small shelf on which Vincent would place his brigade. The position was almost halfway down the southwestern slope of the hill.44 Vincent, a Harvard man, was not a professional soldier; however, no regular officer could have picked a better position for the brigade that day. It would be aligned along the "military crest" where the Confederates could not pass without being observed and taken under fire by the defenders. The lone brigade commander and his flag bearer observed the battle raging in the Peach Orchard but did not see any Confederates to the front. As they sat their horses, shells began to fall near them; first on the right and then a few feet to the left. "They are firing at the flag, go behind the rocks with it," exclaimed Vincent.45 Norton rode his horse behind the large boulders and Vincent followed shortly, gave his mount to Norton to hold, and went back down to the lower ground on foot to continue his reconnaissance. Chamberlain brought his regiment in line among the trees andboulders facing Big Round Top. When his line was formed, he detached Company B, Capt. Walter G. Morrill commanding, as skirmishers in order to extend and protect the left from surprise, as the flank was "in the air". Having passed the 44th New York so the "Butterfield twins" could fight together, the little 16th Michigan assumed its position on the far right of Vincent's brave brigade. The 16th Michigan was exposed in its alignment on the shelf and had its right flank "in the air". Still standing near the signal station, wounded and under heavy musket fire, Warren was justifiably concerned. He had sent two aides, Reese and MacKenzie, to get troops, but was unsure of the results. Hazlett had arrived and decided to bring his battery up but it had yet to arrive. Unable to see what was transpiring with Vincent's brigade, Warren received a call for help from Colonel Rice, to whom command of Vincent's brigade had devolved.53 Warren-with Roebling, Reese and an orderly, riding hard down the hill to get assistance- spotted a brigade marching along the Wheatfield Road, heading toward the Wheatfield to support Sickles. The order to support Sickles had been canceled but the brigade commander, Brig. Gen. Stephen Weed was not yet aware of it. Warren was fortunate indeed. The brigade was the 3rd Brigade of Ayres's Division, which Warren had previously commanded. Warren may not have been quite the "demon of blazing energy" that his biographer, Emerson Taylor, labeled him, but witnesses recalled that he was unusually excited.54 As Warren approached the brigade at a gallop, he spotted the 140th New York, commanded by Col. Patrick O'Rorke, marching in a column of fours. Warren called out to O'Rorke to bring the regiment up to Little Round Top. O'Rorke answered that General Weed had gone forward to locate positions and expected the regiment to follow. "Never mind that," Warren replied. "I'll take the responsibility." Warren's impatient manner convinced O'Rorke of the importance of the task at hand and he turned the regimental column to the left toward Little Round Top.55 Warren left at a gallop but apparently did not ride directly back to Little Round Top with the 140th. O'Rorke was killed leading the regiment down the slope to shore up the crumbling right of the 16th Michigan. Accounts vary significantly as to the part Warren played in the action after O'Rorke reached the crest. Farley indicated that after talking to O'Rorke on the Wheatfield Road, "Warren rode off, evidently bent on securing other troops. But Cpl. James Campbell, Company D, wrote that Warren was directing O'Rorke on the crest of the hill telling him where to position the 140th. "58 Roebling left O'Rorke as soon as they topped the crest of the hill to ride to Meade and report as to the disposition of troops. "59 It is probable that Warren directed him to do so. Early in the afternoon, Maj. Gen. George Sykes had been directed by Meade to support Sickles and had communicated that fact to Sickles. Later, at the 3 p.m. corps commanders meeting at the Widow Leister's house, Meade told Sykes to take his corps and protect the left of the army's position, since Sickles was not in position. Sykes thought that this meant he would have control of the use of his own corps, instead of having to deal them out "piecemeal" to Sickles. Based on his own reconnaissance, Sykes understood that his corps would not be able to fight as one cohesive unit, but he was resisting having Sickles take elements from his corps as he desired. Later that day, Sykes had ordered Weed's brigade to Little Round Top, but Sickles had sent a messenger with orders to bring the brigade to the support of his own line.60 When Warren pulled O'Rorke's regiment out of the brigade column, brigade commander Weed was under the impression that the brigade was in direct support of Sickles. 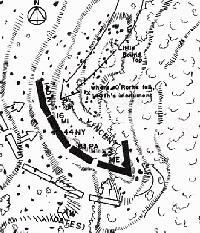 Weed had left O'Rorke "in charge" as he went forward to find the brigade's position.61 The brigade adjutant, Capt. A. S. Marvin and Warren's brother, Edgar, left the brigade to ride to Weed and inform him that O'Rorke had taken his regiment and left for Little Round Top. Capt. Edgar Warren, after finding Weed at Sickles's headquarters on the Trostle Farm, got instructions as to where to post the brigade and rode back and began leading it, without the 140th, to a position in support of Sickles. Sykes, upon learning that the brigade was heading away from Little Round Top, sent a messenger to the brigade to direct it back to the hill. When Captain Warren explained that he was under orders from Weed to reinforce Sickles, the messenger asked to be taken to Weed. Weed learned that Sykes wanted the brigade on Little Round Top, and left Sickles' headquarters and rode back to the brigade.62 Weed evidently left his brigade after giving it orders and rode ahead to Little Round Top. Warren stated that he never conferred with Weed, and left the hill before he arrived.63 Weed's remaining regiments arrived and were posted after the main fighting was over. The 140th New York had fought alongside the 16th Michigan well down the slope, but the rest of Weed's brigade were aligned on the crest of the hill. The 91 St Pennsylvania went in on the right of the 140th, followed by the 146th New York and the 55th Pennsylvania.64 They established breastworks and assisted in collecting prisoners but did little fighting. Weed's regiments were joined by Company L, Ist Ohio Light Artillery, posted an the northern slope of the hill. The signallers made a substantial contribution. Capt. Lemuel Norton, the chief signal officer, picked the position and recommended it to Hall. By merely occupying it, they caused a two-hour delay in Longstreet's attack, due to his decision to countermarch when he saw the signal station. The signal station sent a number of messages detailing movement on the Federal left. Because some of this traffic described Longstreet's countermarch, it has been described as confusing, but their reports certainly provided ample information to Meade's headquarters that there was activity on the left. Most important, they pointed out the activity to Warren when he arrived at the station. He satisfied himself that the message was accurate, and acted on it. Lieutenant Mackenzie deserves recognition for his actions as a determined messenger. After Sickles turned him down, Mackenzie did not ride back and report that fact to Warren; he kept going until he found a responsible general officer who would take action. This was a significant feat for a young officer, and had he not persisted, Vincent would have not arrived on the crest in time. Although George Sykes received criticism for being slow," he took decisive action when called upon by Mackenzie, and responded by initially ordering a brigade to support the position.68 He was a key factor in the sequence of events and continued to provide relief to the hill by redirecting Weed's brigade. Even though Weed's brigade did not figure prominently in the fighting, it must surely have had the effect of discouraging the Confederates from any thoughts of trying one last time to take the hill. Strong Vincent's post war champion, Oliver Norton, did a superb job defending his commander's rightful place in Gettysburg history. Vincent's role is important for two reasons. First, he took the responsibility of quickly moving his command to the hill as soon as he knew that Sykes wanted a brigade posted there. A more cautious commander would have sought the permission of his division commander and lost precious time in the process. Because he understood the importance of time in securing the position, Vincent played a vital role in the afternoon's successes. Secondly, Vincent had the good tactical judgment to place his brigade in exactly the right position. This decision was based on knowing how to fight under the circumstances coupled with a timely reconnaissance. Time has not diminished Gouverneur Kemble Warren's contribution to the salvation of Little Round Top. However, it has made it apparent that like most successful officers, he had a lot of help. Vincent, Hazlett, O'Rorke and Weed responded to the call and lost their lives; along with Sykes, Mackenzie, Martin, and Hall, who also played key parts in the drama, they became the "Saviors of Little Round Top."